August is National Immunization Awareness Month, an annual observance to bring awareness to the importance of vaccines for people of all ages. Immunization Awareness Month was established to encourage people – young and old – to make sure they are up to date on the various vaccines recommended for them. 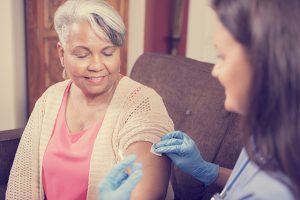 The Centers for Disease Control and Prevention (CDC) advises that all adults need immunizations to keep them from getting and spreading serious diseases that could result in poor health, missed work and not being able to care for family or themselves. Older adults may need one or more vaccines, even if they received them as a child or as a younger adult. Immunity to some diseases can wear off over time, and as people age, they are at an increased risk of contracting various illnesses. A seasonal flu vaccine every year. The flu vaccine is specifically important for people with chronic health conditions, pregnant women, and older adults. The CDC estimates that since 2010, flu-related hospitalizations in the United States have ranged from 140,000 to 710,000 and flu-related deaths have ranged from 12,000 to 56,000. The Tdap vaccine once if they did not receive it as an adolescent. This protects against pertussis (whooping cough). Adults also should get a Td (tetanus, diphtheria) booster shot every 10 years. Pneumococcal vaccines, which protect against pneumococcal disease, including infections in the lungs and bloodstream. This is recommended for all adults over 65 years old, and for adults younger than 65 who have certain chronic health conditions. About 900,000 people get pneumococcal pneumonia every year, leading to as many as 400,000 hospitalizations and 19,000 deaths. Talk with your senior loved one’s doctor or other healthcare professional to know which vaccines are recommended for them. 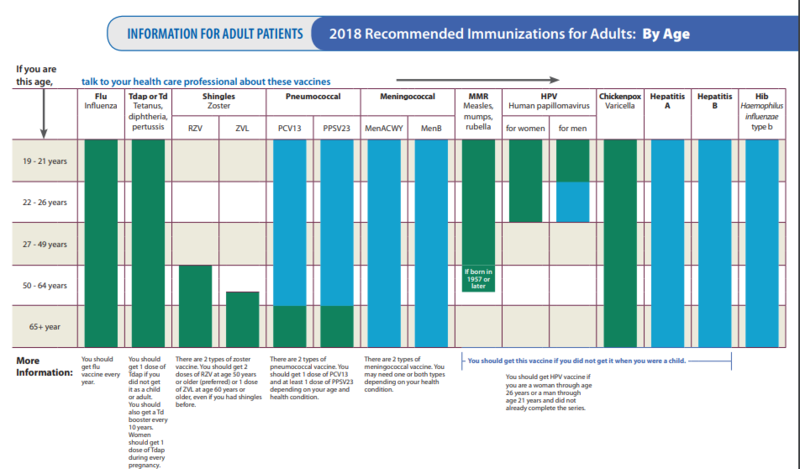 And check out this immunization schedule by age and by health condition as a guide.